This precious pillow set is perfect for adding a little Christmas cheer to any room or living space. 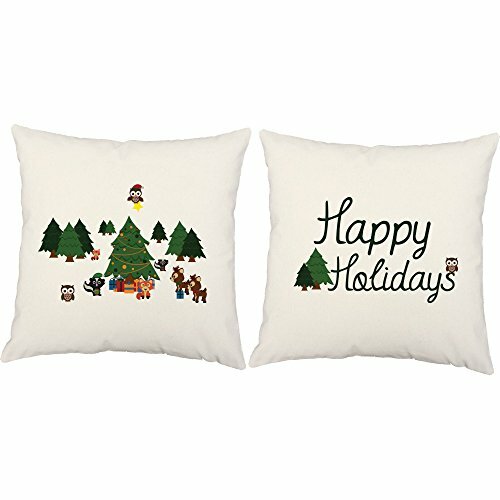 Featuring a bevy of adorable forest friends having their own holiday celebration, this pair of pillows is sure to bring a smile to even the grouchiest grinch! ... CONTENTS: Two weather resistant polyester throw pillow covers measuring approximately 20x20 inches (50.8 x 50.8 cm) each. ; Two polyester pillow cushion inserts. Set of two white Winter Wonderland Woodland Animals throw pillows. Each pillow cover measures approximately 20 x 20 inches (50.8 x 50.8 cm). Handmade in the USA. Pillow cover sizes are approximate. Only sold together. Prices are for a set of 2. Removable pillow covers make washing really easy. For optimal fullness we use slightly larger pillow cushion inserts. All pillow covers feature 3 quality wooden buttons and are suitable for outdoor use. If you have any questions about this product by RoomCraft, contact us by completing and submitting the form below. If you are looking for a specif part number, please include it with your message.